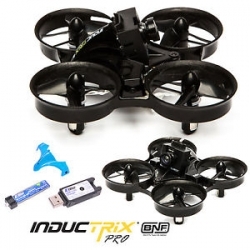 The Inductrix FPV Pro is the high-performance, micro FPV drone taking indoor racing performance to the next level. Building on the popular Inductrix platform, the Inductrix FPV Pro answers the call to those seeking heightened performance in a lightened, more durable profile. A significant feature is the Betaflight configurable flight controller which provides you the freedom to adjust all flight parameters, rates, and gains to fit your flying style. A new frame design with added reinforcements improves durability, making crashes worry-free. A new and improved camera and VTX combo flaunt a smaller monopole and lighter profile, while giving you more frequencies and bands to choose from. The included removable canopy gives the micro racer a sleek new design and color scheme without hindering weight or performance. The included 200mAh battery offers ample flight times, increased by the lighter overall profile. With the Bind-N-Fly® completion level, all you have to do is bind a compatible Spektrum transmitter and you're off to the races. Hood River Hobbies is your source for hobbies in the Columbia River Gorge. radio control airplanes, drones, cars & boats a large selection of models, trains, kites, building supplies, paintball, games and gaming supplies, cards games and unique, fun and interesting novelty items.